William S. Paley (September 28, 1901 – October 26, 1990), coming from a family of Ukrainian Jewish immigrants, was the chief executive who built CBS from a small radio network to the dominant radio and television network operation in America. Paley formulated the modern state of network television and radio by pioneering the advertising model still in use today. His view of broadcasting as communication of entertainment and information to the public, that public being the whole nation, continues to guide the media, influencing society profoundly. Paley was born in 1901 in Chicago to Samuel Paley and Goldie Drell. Paley's father, Samuel, was a Ukrainian Jewish immigrant. When he was 12, William added the middle initial S. to his name, "wanting a little more panache in his name." Samuel Paley ran a cigar company and, as the company became increasingly successful, the new millionaire moved his family to Philadelphia in the early 1920s. Paley studied at the University of Chicago then transferred to and graduated from the University of Pennsylvania's Wharton School of Finance and Commerce in 1922. Paley married Dorothy Hart Hearst in 1932. She was the former wife of William Randolph Hearst, Jr., son of William Randolph Hearst. The couple had two children, Jeffrey and Hilary, before divorcing in 1947. Paley was a notorious ladies' man. His first marriage ended when a newspaper published the suicide note written to Paley by a girlfriend. He provided former lover Louise Brooks a stipend for the rest of her life. Paley married the divorced socialite and fashion icon Barbara "Babe" Cushing Mortimer later in 1947. Paley had two children with her, William C. Paley and Kate. The two remained married until her death in 1978. Paley and his second wife, despite their success and social standing, were barred from country clubs on Long Island because he was Jewish. Instead, the Paleys built a summer home on Squam Lake in New Hampshire and summered there for many years, routinely entertaining friends like Lucille Ball and Grace Kelly. Squam Lake was the location for the 1981 Mark Rydell film On Golden Pond starring Katharine Hepburn and Henry Fonda. The house was later donated to Dartmouth College and converted for use as a conference center. Paley died on October 26, 1990 of kidney failure in New York City. Paley's career took a fateful turn in 1927 when his father and some business partners bought a struggling Philadelphia-based radio network of 16 stations called the Columbia Phonographic Broadcasting System, the forerunner of Columbia Broadcasting System (CBS). Samuel Paley's intention had been to use his acquisition as nothing more than a medium for advertising to promote the family's cigar business, which included the La Palina brand. Within a year, under William's leadership, cigar sales had more than doubled, and in 1928 the Paley family secured majority ownership of the network. Within a decade, Paley had expanded the network to 114 affiliate stations. Paley quickly grasped the earnings potential of radio, and recognized that good programming was the key to selling advertising time and, in turn, bringing in profits to the network and to affiliate owners. Before Paley, most businessmen viewed radio stations as standalone outlets—in other words, the broadcast equivalent of the local newspaper. The individual stations originally bought programming from the network and were thus considered the network's clients. Paley changed broadcasting's business model, not only by being a genius at developing successful and lucrative programming, but by viewing the advertisers (sponsors) as the most significant element of the broadcasting equation. Paley provided network programming to affiliate stations at nominal cost, thereby ensuring the widest possible distribution not only for the programming but the advertising. The advertisers then became the network's primary clients and, because of the wider distribution brought by the growing network, Paley was able to charge more for the advertising time. Affiliates were required to carry programming offered by the network for part of the broadcast day, receiving a portion of the network's income from advertising revenue. At other times in the broadcast day, affiliates were free to offer local programming and sell advertising time locally. Paley's recognition of how to harness the potential reach of broadcasting was the key to his building CBS from a tiny chain of stations into what was eventually one of the world's dominant communication empires. 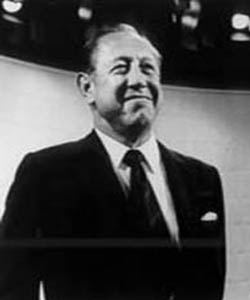 During his prime, Paley was described as having an uncanny sense for popular taste, and exploited that taste to build the CBS network. As war clouds darkened Europe in the late 1930s, Paley recognized Americans' desire for news coverage of the coming war and built the CBS news division into a dominant force just as he had built the network's entertainment division previously. During World War II, Paley served in the psychological warfare branch in the Office of War Information under General Dwight Eisenhower and held the rank of colonel. It was while based in London during the war that Paley came to know and befriend Edward R. Murrow, CBS's head of European news. CBS expanded into television and early through Paley's strong, some would say ruthless, maneuvering rode the post-war boom in that medium to pass NBC, which had dominated radio. Paley became the best-known executive in network television, personifying the control and vision which marked the industry through its heyday of the 1980s. "Bill Paley erected two towers of power, one for entertainment and one for news," 60 Minutes creator Don Hewitt said in his autobiography Tell Me A Story. "And he decreed that there would be no bridge between them...In short, Paley was the guy who put Frank Sinatra and Edward R. Murrow on the radio and 60 Minutes on television. The relationship between Paley and his news staff was not always smooth. Paley's friendship with Ed Murrow—one of the leading lights in the CBS news division and by then a vice president—suffered during the 1950s over the hard-hitting tone of the Murrow-hosted See It Now series. The implication was that the network's sponsors were uneasy about some of the controversial topics of the series, leading to Paley worrying about lost revenue to the network as well as unwelcome scrutiny during the era of McCarthyism. In fact, See It Now lost its Alcoa sponsorship in 1955 and eventually its weekly Tuesday time slot, though it continued as a series of specials until 1958. In 1972, Paley ordered the shortening of a second installment of a two-part CBS Evening News series on Watergate—after he was contacted by Charles Colson, an aide to President Richard M. Nixon. And later, Paley briefly ordered the banishment of instant analysis by his news people following presidential addresses. Paley's reporters took umbrage with what they believed to be censorship of their reporting in the Watergate piece and had traditionally enjoyed the ability to sway public opinion with their instant analysis following presidential addresses. Paley retired as CEO of CBS in 1977, but remained chairman of the network, firing three potential successors before hiring Thomas Wyman in 1983. Paley fired and replaced Wyman as chairman in 1986. He remained chairman till his death in 1990. In the 1940s, Paley and Leon Levy formed Jaclyn Stable that owned and raced a string of thoroughbred race horses. Paley purchased Major League Baseball's New York Yankees in 1964 from Dan Topping and Del Webb for $11.2 million. He owned the team for nine unsuccessful years, not making the playoffs once. Paley sold the team in 1973 to Cleveland shipbuilder George Steinbrenner and a group of investors for $10 million. In April 2006, Forbes Magazine estimated that the Yankees were worth $1.26 billion. Paley had an avid interest in modern art and built up an outstanding collection. He became a trustee of the Rockefeller family's Museum of Modern Art in the 1930s; in 1962 he was tapped by then chairman David Rockefeller to be its president. In 1968 he joined a syndicate with Rockefeller and others to buy six Picassos for the museum from the notable Gertrude Stein collection. He subsequently became chairman, stepping down from the Museum in 1985. Paley transformed the broadcasting industry into the model that operates in the United States today. He changed broadcasters from operating as individual units to acting as actual networks. This vision set the stage for the large broadcast conglomerates to hold power in television and radio. Such a development played a large role in the popularization of such outlets as national networks such as CNN and the advent of cable television, which could easily send the same programming to people across the whole country. Other than this grand influence on broadcasting, Paley was at the helm of the CBS network for some of its most successful programming including I Love Lucy, The Ed Sullivan Show, and All in the Family. Paley was respected not only for building CBS into an entertainment powerhouse, but for also encouraging the development of a news division that went on to dominate broadcast journalism for decades. Paley's support of the news led to the heyday of network news, which saw millions of Americans receiving their news from television rather than newspapers, which represented a large shift in the media for the American public and helped begin the decline in readership of newspapers. The Museum of Television and Radio hosts an annual panel series, with casts and crews from new series, which is named after Paley. The museum itself was founded in 1976 as the Museum of Broadcasting, partly with Paley's help. Its main building on West 52nd Street in Manhattan is named after the longtime CBS chief. ↑ 1.0 1.1 Mike Brewster, “Bill Paley: Molder of Modern Media,” Business Week (June 1, 2004). Retrieved July 25, 2007. ↑ Louise Brooks: Biography, Lenin Imports. Retrieved July 26, 2007. ↑ Christopher H. Sterling, “Paley, William S.,” Museum of Broadcast Communications. Retrieved July 26, 2007. ↑ Don Hewitt, 2000, Tell Me a Story: Fifty Years and 60 Minutes in Television (Public Affairs, ISBN 158648141X). ↑ “William Paley: 1901-1990,” Macleans 103(45): 58. Available online from the Bing Crosby Internet Museum, compiled by Steven Lewis. Retrieved July 26, 2007. ↑ Daniel N. Fasanello, “William S. Paley,” Pennsylvania State University. Retrieved July 26, 2007. ↑ New York Yankees, Baseball Team Valuations Forbes.com. Retrieved July 26, 2007. ↑ David Rockefeller, 2002, Memoirs (New York: Random House, ISBN 0679405887). ↑ William S. Paley Spartacus Educational. Retrieved July 26, 2007. History of "William S. Paley"
This page was last modified on 21 October 2016, at 21:50.